There have been days of joy and hours of tears. But it was all worth it! Learning is an important experience, but for children it should also be a fun one. If children find school enjoyable, they are going to appreciate it much more, and thus they will find learning enjoyable overall. At Paramount International School, we propagate that : A mind eager to learn is a mind that will absorb more information. Before they come to school, children have been learning in a variety of environments i.e. in their homes , childcare and community settings. Children arrive at school with different backgrounds , experiences and also at different stages of development. Positive early experiences with school are of paramount importance to young children. Children thrive within classrooms that meet their physical and developmental needs and that provide a secure, respectful, and nurturing environment. Hence, Kindergarten teachers play a complex and multidimensional role as they lay the foundation for learning . The playway activities adopted by the Kindergarten teachers help the children to have a clear understanding of the concepts. So, to recognize the importance of this milestone school year and to celebrate our youngest children’s achievements, while also ushering them into their “official” start of school, the school celebrated the culmination of Kindergarten with a graduation ceremony and party on 7 March, 2012. The dress code of the day was White & Black. The children enjoyed a delicious lunch & sweets especially arranged by the school keeping in mind their choice and favourite eatables . Some performances by the children described their feelings regarding their stay in Kindergarten from the depth of their hearts as they spoke ,“ This is the day to be together and celebrate happiness and our wonderful stay”. They thanked their mother teachers who helped them to learn, read and write. Last but not the least they also thanked the M. D. Mrs. R.L. Saroha who always encouraged them by rewarding them for their every effort and achievement. The ceremony concluded by an inspirational message of Mrs. R.L. Saroha ,the M.D. of the school . Finally ,after the distribution of the prestigious Graduation Hat, each child left the Kindergarten with a sense of pride and a smile on his / her face . For each Kindergartener , we wished a wonderfully special experience as they enter Class I and continue onto each new year after. 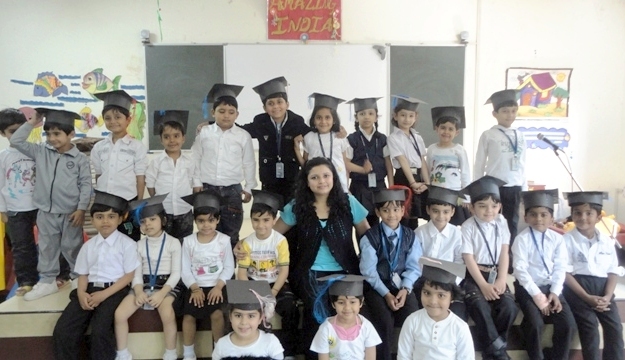 It was with pride and nostalgia that we concluded the Kindergarten Graduation Ceremony . Punjabi film “CANADA DI FLIGHT” is an full entertainer with social message. Campus placements making a ridicule of engineering graduates.